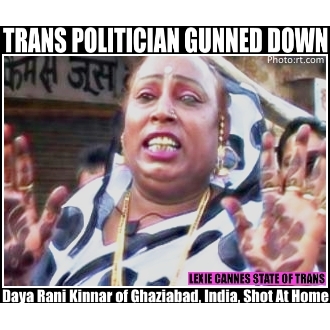 LEXIE CANNES STATE OF TRANS — Police in Uttar Pradesh, India have arrested two people for the murder of trans woman Daya Rani Kinnar. Police also know the identity of a third person involved in the shooting and is actively pursuing leads to his wherabouts. The victim was gunned down at her home in Ghaziabad early July 4, 2015, in what police said at the time was a well-planned murder. She was apparently shot as a train passed by, delaying the discovery of her body. Following leads, police arrested two men a few days later. At least one was well-known to the victim. A news reports states that the duo admitted to the police of murdering her for the purpose of taking her money. Daya Rani Kinnar is noted for having run for political office several times, including as recently as 2014. I believe she might have been interviewed on a documentary filmed in India some years ago, noting her as a transgender politician. I could be wrong if was indeed her. I’m limited in my resources to check this fact out. Oh I hate to say this but, I am ALMOST relieved that she was killed in a robbery attempt. No I am far from happy that she was killed, and I am sending her family my deepest condolences. May no other trans woman be harmed, ever. Unfortunately, we have no way of knowing at this time whether her murderers targeted her because she was trans and therefore perceived as weak and unable to defend herself or whether she simply looked more affluent than the perpetrators and was thereby a tempting target. Uttar Pradesh is a VERY economically depressed and poorly-controlled region of India. If memory serves, Kinnar was quite active in attempting to improve the economic status of the lower caste and non-caste citizens. Ironic, isn’t it, that she was killed by two people whose lives she fought to enrich? Good point Michelle. And yes, older news articles point towards her being concerned with economic conditions for everyone in living in that area.